Shown above mounted on a lathe holding a project mounted between the headstock and tailstock morse tapers.. Shown at right off the lathe with the morse taper unscrewed from the aluminum drive head and the tailstock head standing on the morse taper. The non-marring urethane cups are yellow. The primary function of the Carter M-Chuck™ is to turn off the center nubs left from the initial turning with the Perfect Sphere™ system. Then it is used for all final shaping, sanding or finishing required. 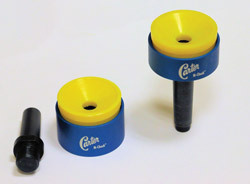 The system includes two 2" anodized aluminum heads with removable and replaceble non-marring urethane cups that can accommodate most spheres from 2" to 6" in diameter. Larger cups will be available in the future along with other inserts for jam chucking and more. This system can be used on any lathe that has a #2 morse taper in the headstock and tailstock. This M-Chuck System comes complete with one aluminum M-Chuck™ head with 3/4 by 10 internal threads with a #2 Morse Taper adaptor for the headstock, one aluminum M-Chuck™ head with ball bearing and #2Morse Taper for tailstock, two 2" non-marring urethane sphere cups.